Generous chunks of lobster sit in an orange and coconut vinaigrette. Here’s another wildly expensive restaurant I’m sending you to. I love the Pool. I’ve already been three times in the past ten days. It’s not like I have a rich sugar daddy or a fat trust fund or a company I can charge it to. But since I don’t have a house at the beach, or a car and driver, or a full-time gigolo, and I’m not tempted by $5,000 handbags, I can afford to occasionally go for broke at dinner. An evening at the Pool makes me feel rich. 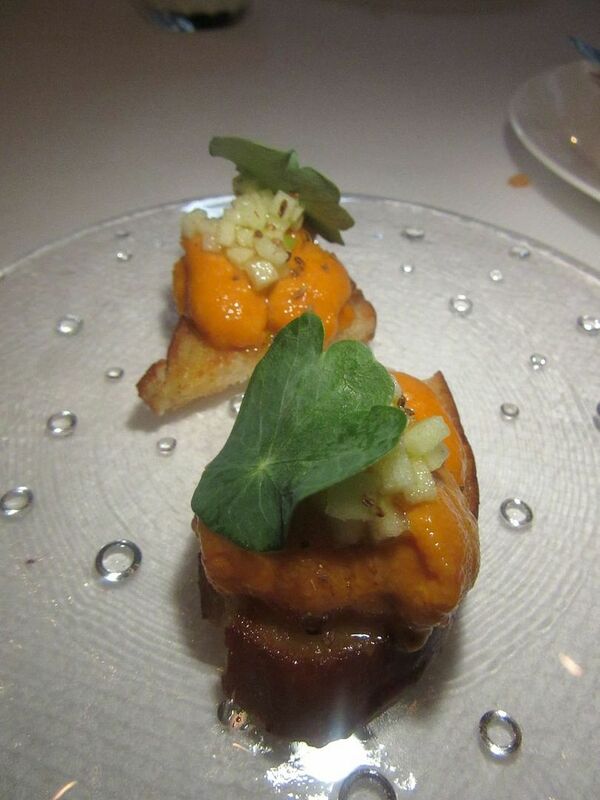 Santa Barbara sea urchin topped with chopped apple is piled on pretzel toast. 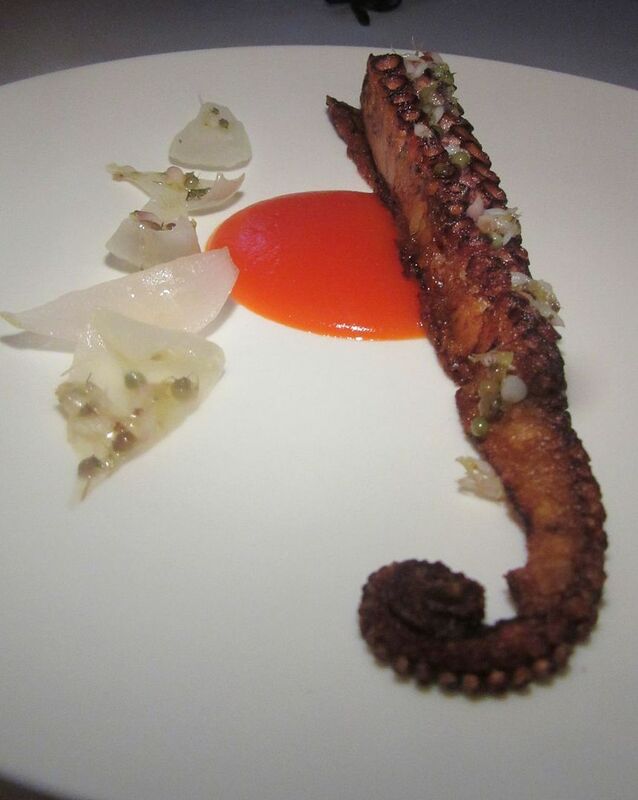 Octopus fans will like this charred appendage with onion bossoms and sweet pepper. Sea urchin toasts, grilled octopus, exquisitely perfect turbot or the rack of lamb with scallops surf’n’turf definitely please me. The gathering of Santa Barbara uni on pretzel bread might seem teasingly runty. But note the pretty lush pile-up (more generous the first night, less so the second) under a sprinkle of apple bits. Will my companions sue me if I finish both halves without sharing? The whole Portuguese turbot cooked a la plancha is enough for two of us to share. These crispy fat-glazed russet ovals are a delicious invention. Octopus lovers will savor one long arm, tender and sweetly caramelized from the grill. 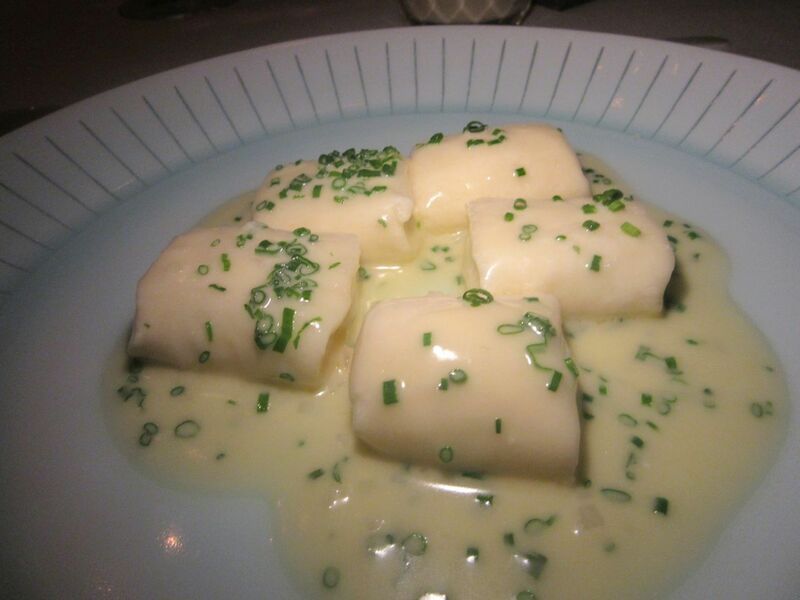 A sweep of turbot in solemn splendor on the plate, arrives as rare as it can be and still be cooked. With each bite, it seems more perfect. Russet potatoes come all the same size from Lucky Dog Farm, the waiter explains, permitting these perfect slices confitted in duck fat. Definitely a must. Cumin-scented rack of lamb and scallops is on the menu as surf and turf for two, $65 pp. 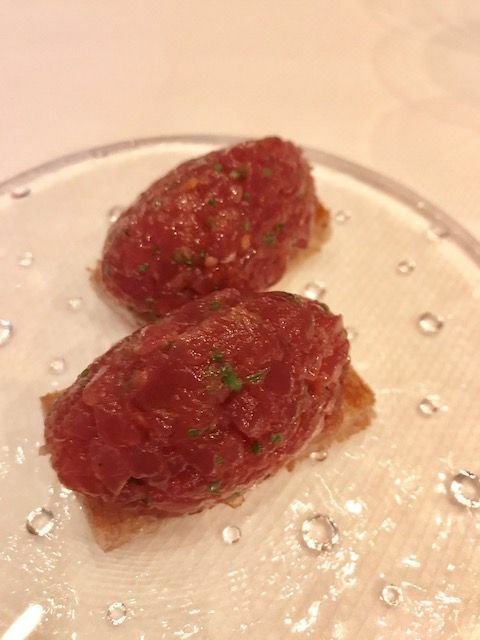 Rose-rare lamb fills my mouth, a carnal bite scented with cumin. A half moon of delicate sea scallop follows. It’s a dish for two to share. 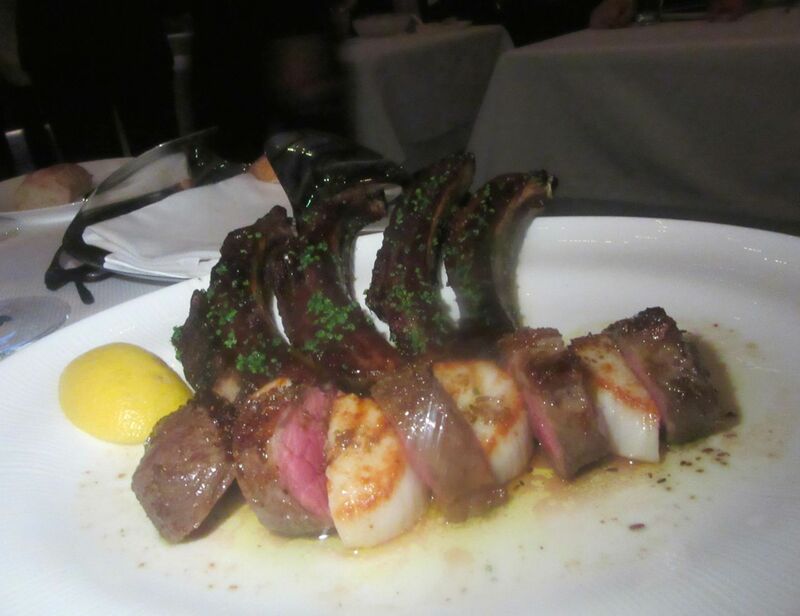 The ribs of five chops are cloaked in fragrant meat and fat worth trying to separate, a gesture I’ve never encountered in four decades of indulgent dining where lamb chop ribs are usually stylishly naked. The same square, marble-edged pool has a new rosier glow from amber lights. 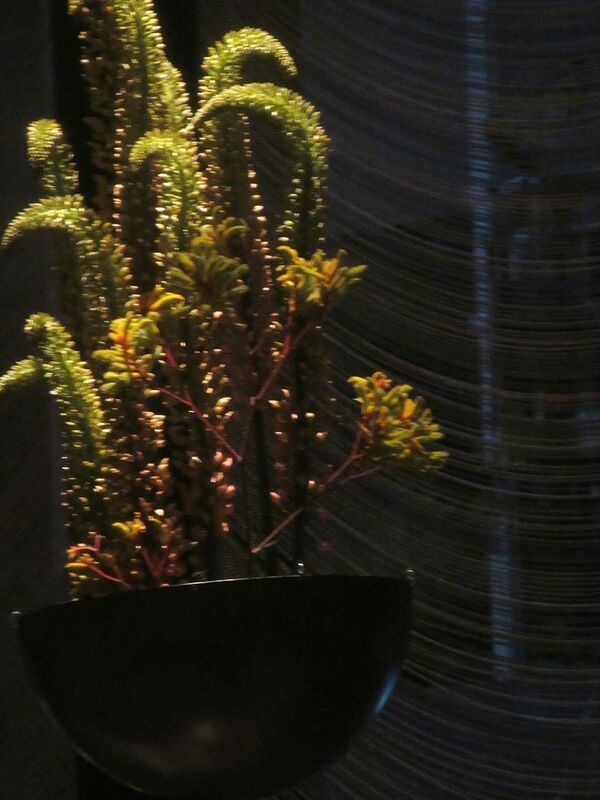 The big bowls of illuminated Eremurus that hang at the landmark rippling curtains strike me as an odd choice. 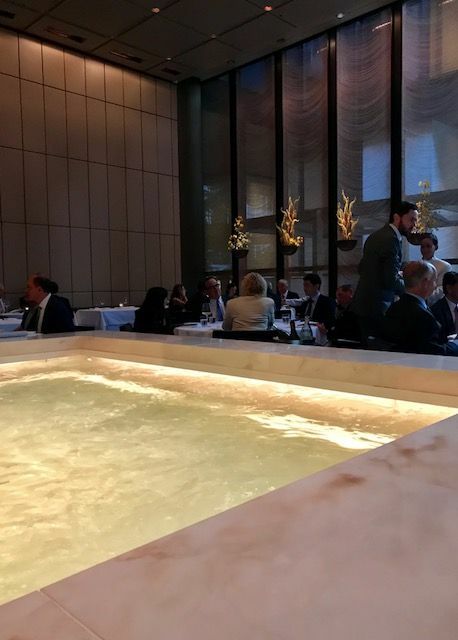 I didn’t anticipate a high like this in the dark days when Aby Rosen, the new owner of the Seagram Building, swept the Four Seasons team out the door. I wasn’t a regular in the Power Lunch scene and rarely showed up in the Pool Room. But the Mies van der Rohe-Philip Johnson temple had been imprinted in my foodie DNA from its arrival in 1959, when I first came with my father. 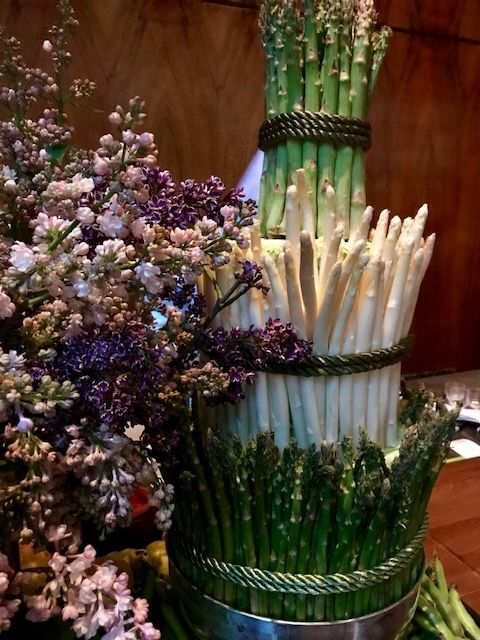 I’d been documenting its rise and fall since 1970, when I eavesdropped as James Beard free-associated cold weather feasts for Restaurant Associates stalwarts George Lang and Paul Kovi in “Winter Comes to the Four Seasons: Can Spring Be Far Behind?” Click here to read it. 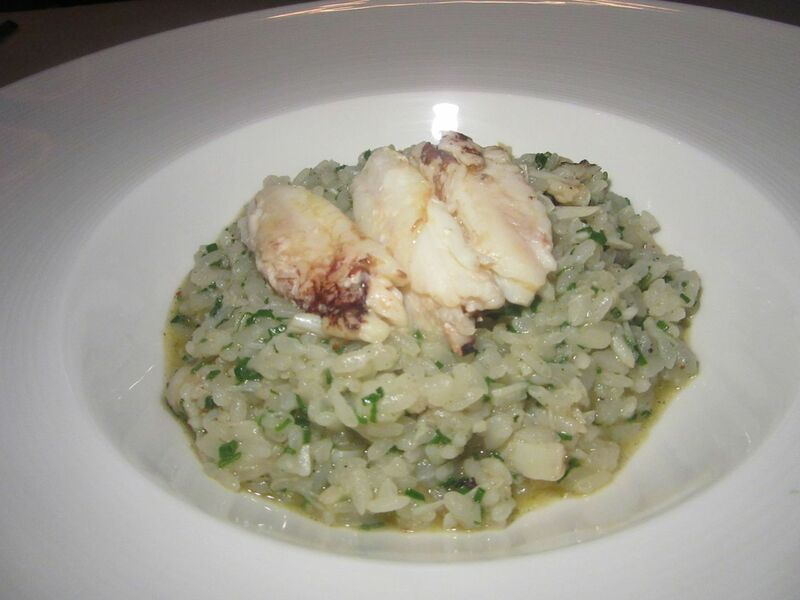 Among the appetizers: a big bowl of Dungeness crab rice with fresh bay leaf. 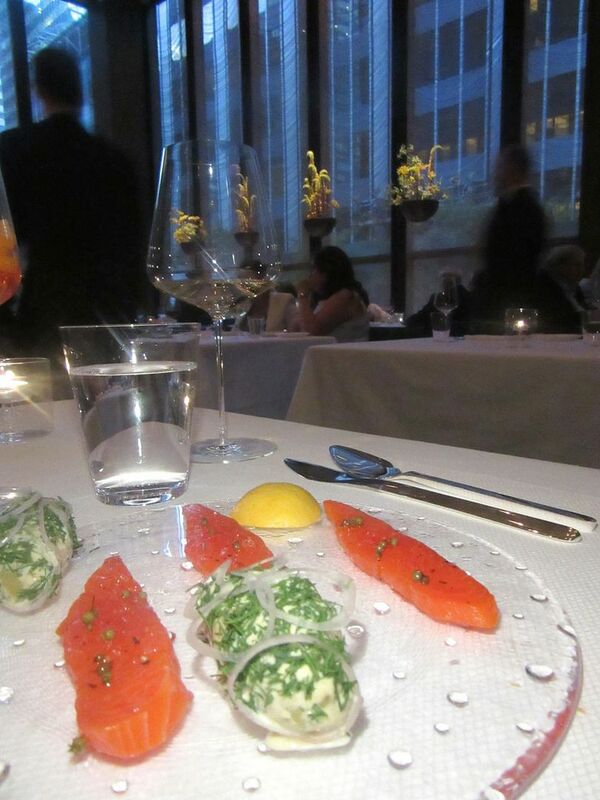 A trio of cured King salmon filets with potatoes is offered as a starter. Of course you’re here for fish but sheep’s milk ricotta gnudi in chamomile are wondrously light and delicious. But now the revolution. Rosen signed the Major Food Group to run the food show, managing partner Jeff Zalaznick with chefs Mario Carbone in the Grill and Rich Torrisi in the Pool. The players who created the idiosyncratic Carbone, Dirty French, Sadelle’s and Santina proceeded to immerse themselves in studies for months, seemingly beyond merely respectful of the challenge. 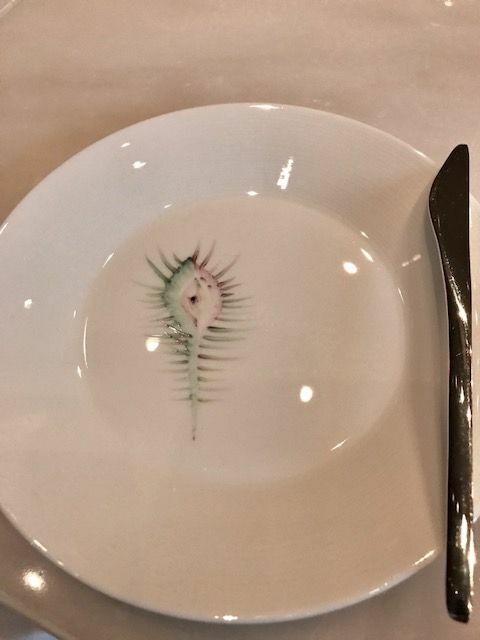 Sea creatures swim in handmade service plates. Dana Stoddard photo. 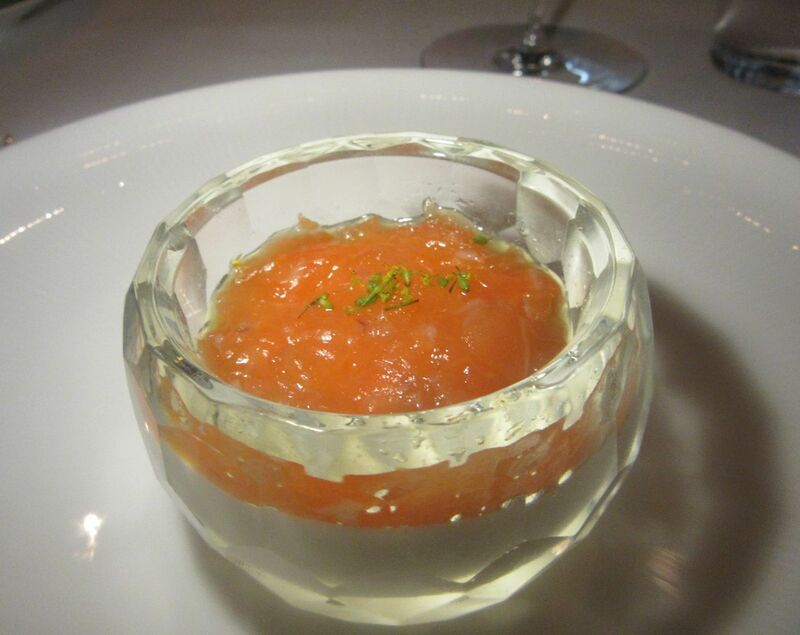 Lesuer butter is topped with salmon tartare in carved crystal bowls. Dana Stoddard photo. Millions were spent just on cleaning the landmark, creating two 21ST-century kitchens, furnishing the pricey show-off intimations of ‘50s luxury wheeling about in the Grill, creating the Pool Lounge in mother-of-pearl and mirror, finding lookalike metal and leather furniture and traveling to Japan to oversee artisans hand-painting fanciful sea creatures on the Pool plates. I don’t have my own Calder at home so this one endlessly rotating above is a thrill for me. It’s calm sealed off from the hubbub in the Grill. Minions in Tom Ford suits stand waiting to welcome the early Pool diners. That’s us. The house-made mini baguettes with needle-pointy noses have not yet arrived warm from the oven, and I’m already thrilled. 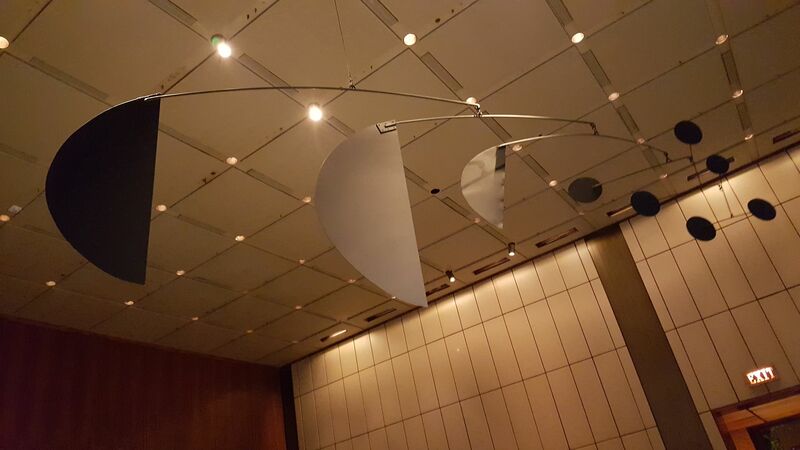 A giant Calder rotating over my head above the pool may not impress everyone, but I’m mesmerized by its sweep. 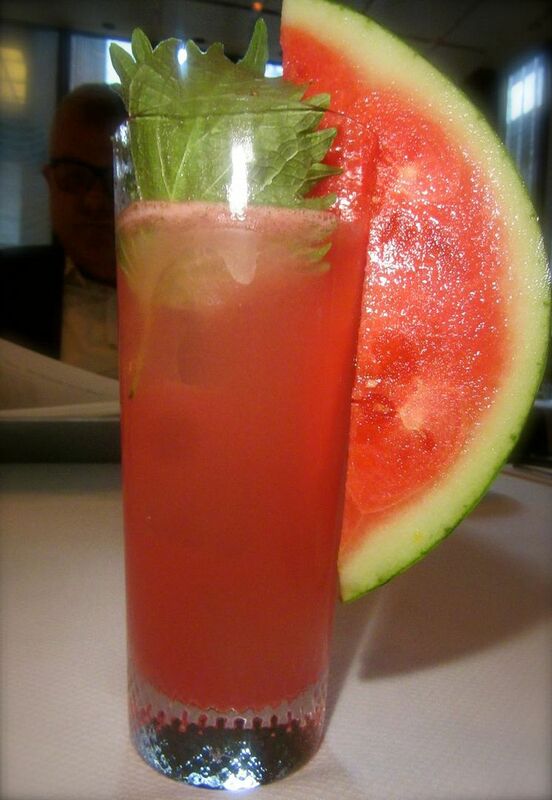 The watermelon attached to this rum cocktail is so perfect, my friend assumes it is fake. It’s the same square pool in its marble frame, but the underwater lights, more of them, are amber now. And the music is not as strident as in the Grill. It’s bossa nova and reggae -- Harry Belafonte in a Caribbean mood, the Girl from Ipanema -- supposedly evoking water and islands and fish, but I’d banish that music too. “It’s to discourage us oldies from coming,” a friend observes. Too bad it can’t be Billie Holiday all night, or Sinatra or Coltrane. Nor am I nuts about the illuminated arrangements of plants that hang in front of the majestic rippling landmark metal curtains. Whatever they are. Eremurus, Zalaznick tells me. Supposed to evoke coral. Looks like cactus to me. 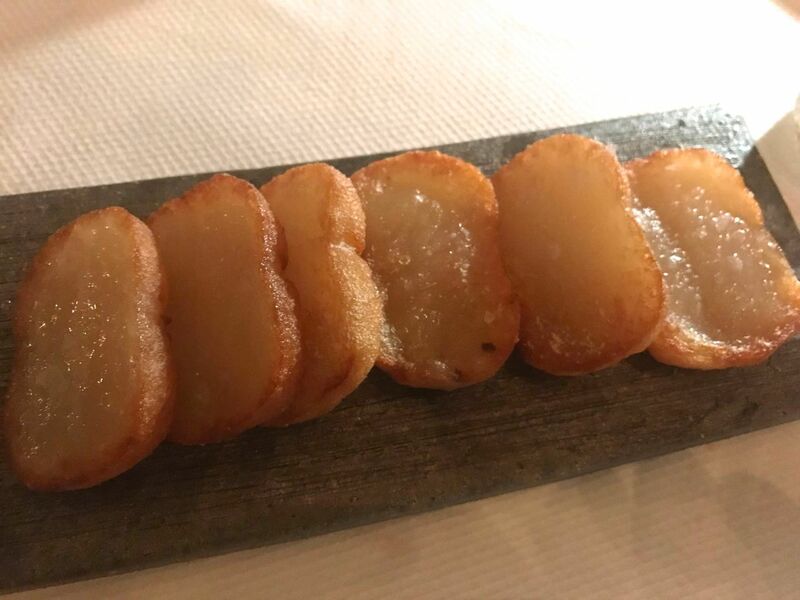 I’m more impressed with the heavy linen cloth, the butter with salmon tartare on top in carved crystal with mother-of-pearl paddles, those delicious rolls, alas, too delicious. Why did we ask for more? Assistant GM Christie Cozac lugs a load of the day’s catch as an enticement for our contemplation. The menu changes, of course. It’s about fish and the daily catch is not predictable. 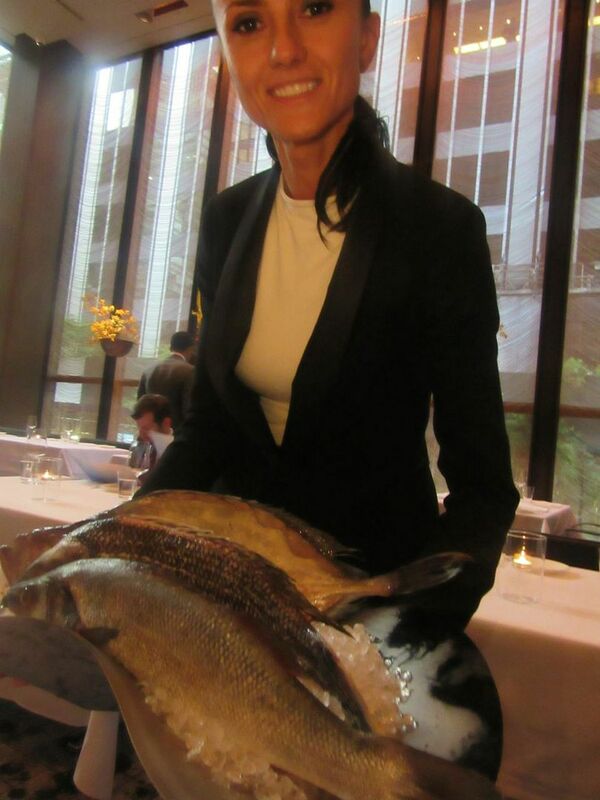 One Saturday night Christine Cozac, the assistant general manager of the Pool, lugs a duo of giant fish to our table – looks like 25 pounds or more to me. But I assume we’d all have to eat the same fish. So we pass. On another evening, a Tuesday, there are only three items listed under “Toasts,” rather than the five offered earlier. But there’s an appealing collection of fish. 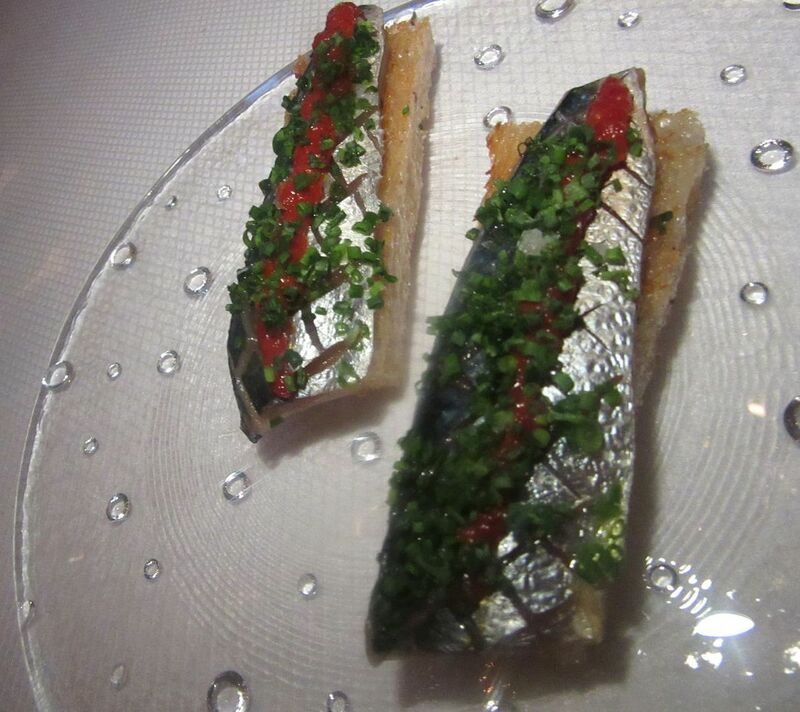 Another pretty toast offering is Greek sardines with piquillo and lemon. I just plunge in, not letting myself brood about appetizers price at $22 to $36, entrees $41 to $65 to whatever the market decides, and wines marked up accordingly. Sometimes grapenut friends treat, choosing a pricey white without flinching. My niece and I share two small yellowfin tuna toasts. The chilled gazpacho salad with lemon cucumbers, grape tomatoes, Tristar strawberries and sea beans strikes my friend Marcia as a perfect starter. (It’s okay but I’d rather have a spicy gazpacho soup, myself.) Her husband seems to enjoy tuna carpaccio with artichoke relish. 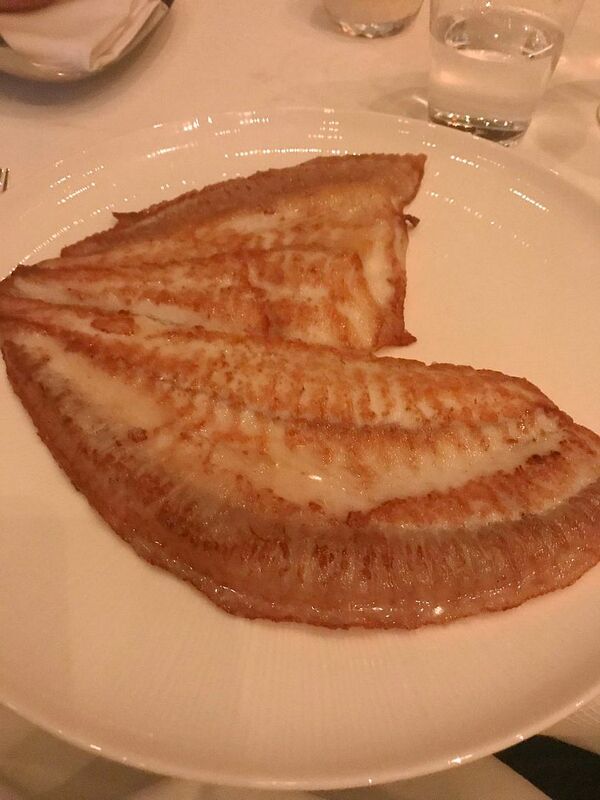 I’m sharing Marcia’s $74 Meyer lemon meunière glazed Dover sole -- too thin and a tad overcooked, overwhelmed by its saucing. 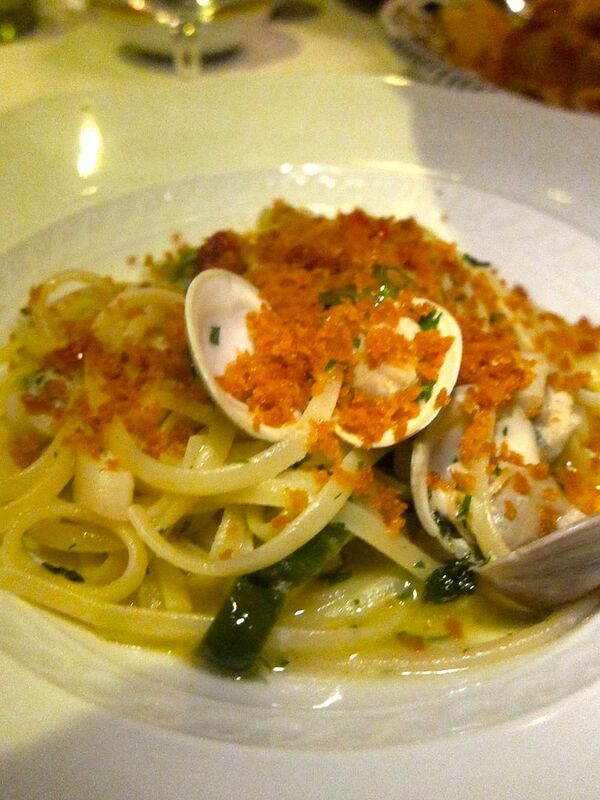 Unlike the monkfish with hearts of palm in an ocean emulsion. That’s heavenly. 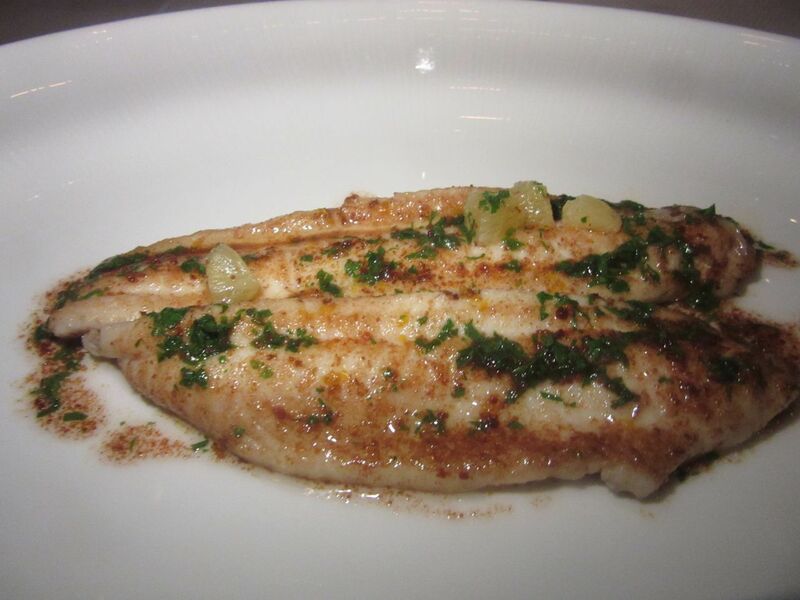 Two of us sharing the Dover sole find it overwhelmed by its saucing and also, too-cooked. The first time I tried the lobster Floridian, I found the orange and coconut vinaigrette too sweet (though the friend who ordered it was effusively happy). 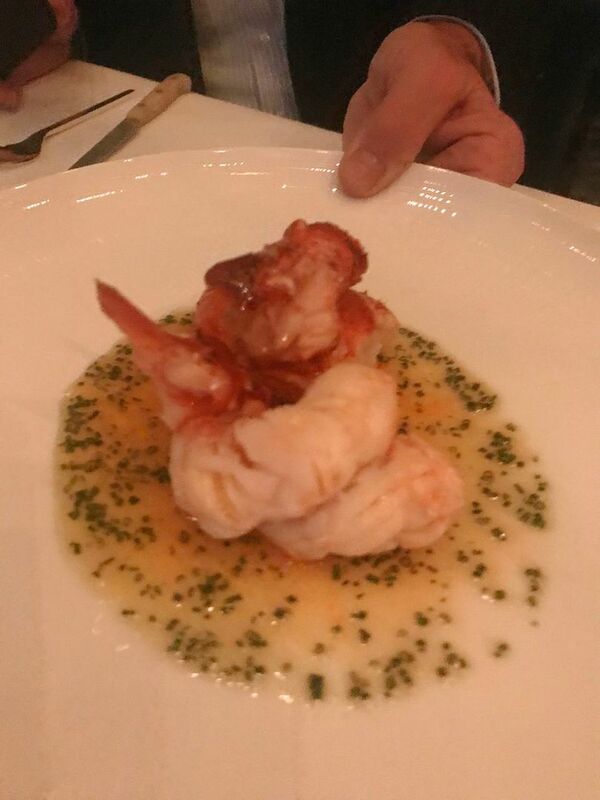 As before, the big chunks of lobster are perfectly cooked, and tonight the sauce seems less sweet. Sides change every night. These buttery browned zucchini halves seem to please all of us. I wonder if vegetable sides are left to the whim of a mere cook. 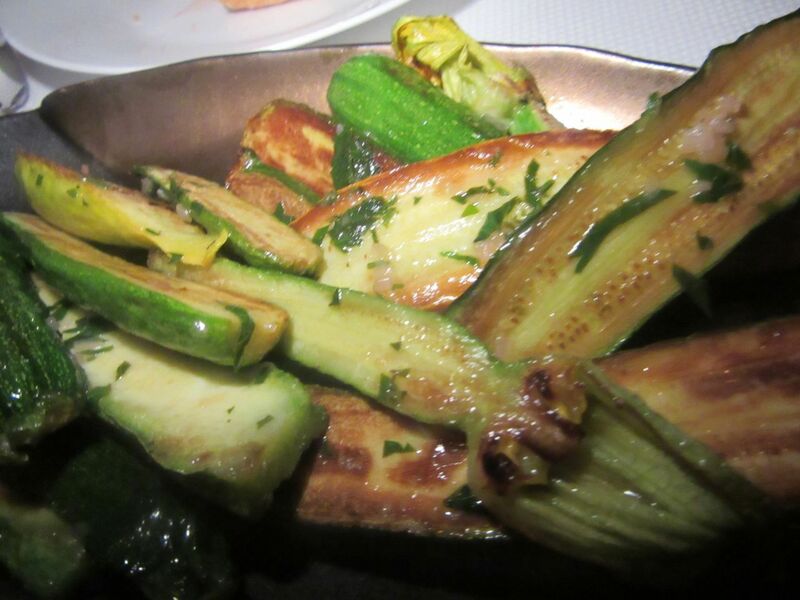 Buttery browned zucchini is a treat at an early dinner. But in thin unbuttered slices days later, zucchini is a zero. It goes without saying that the kitchen is evolving right now. I don’t suppose anyone’s waiting for me to give the final word. I’m not waiting. This is my first word. It didn’t seem I’d eaten so much but I could only manage a bite of strawberry shortcake with corn and lychee. The Meyer lemon meringue with white sesame and fromage blanc by Manresa veteran Stephanie Prida seems small for an $18 dessert. 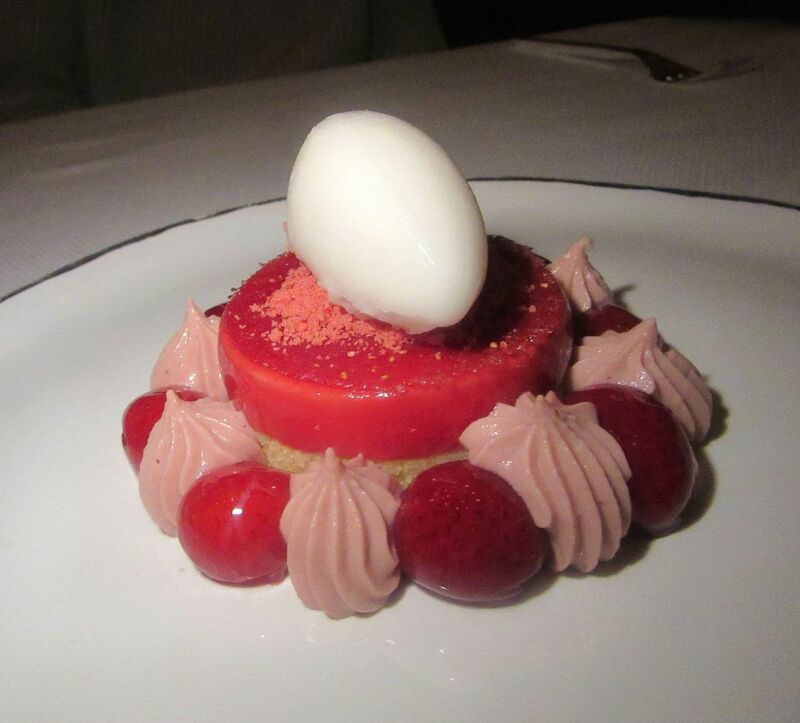 Her strawberry shortcake with sweet corn and lychee is more shareable. 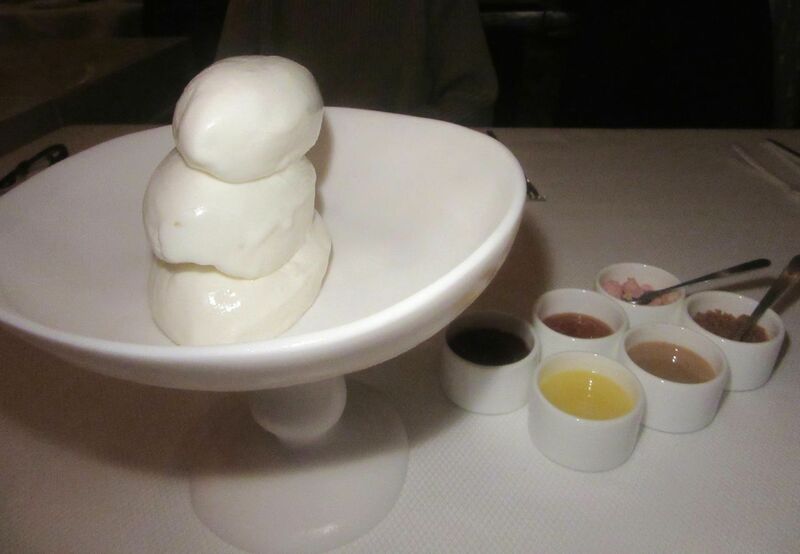 But my favorite is the sweet, silken frozen yogurt -- made to order -- three scoops in a tall white china compote. It comes with “seasonal toppings” in small dishes, some of them highly exotic, like mandarinquat and plumcot as well as graham cracker crumbs, peach jam, candied strawberry caramel, yuzu citrus curd and chocolate crumbs. Just-made frozen yogurt with eight seasonal toppings, mostly fruity, is my favorite dessert. 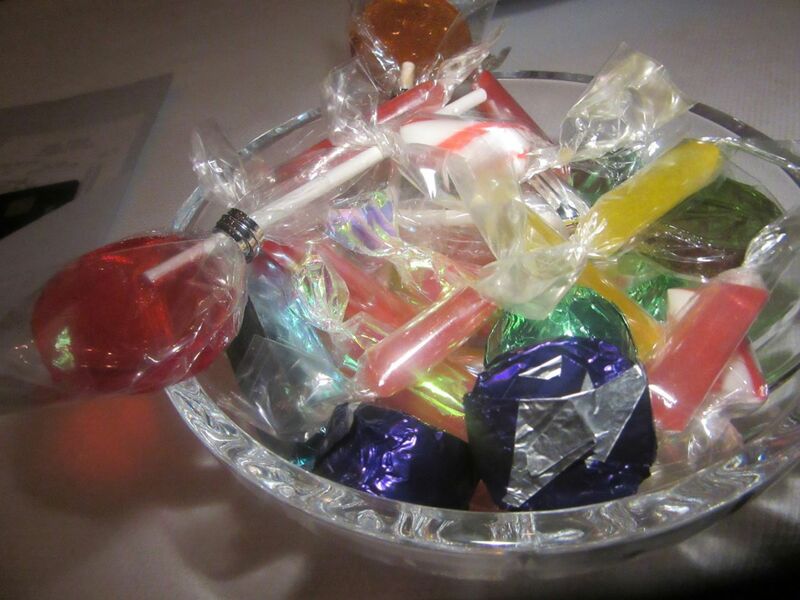 One evening a big bowl of candy arrives, a birthday-party hodgepodge: sucking candies and foil-wrapped peanut butter truffles. But I’ve not seen it again. I ask the last evening where it might be, and the answer is silence. I imagine The Pool prefers to satisfy a sweet tooth with its dazzling collection of Château d’Yquem. It comes by the glass at $90 to $150, by the half bottle for $300 to $780, or by the bottle, from $675 for the1993 to $19,000 for the 1900. “Please inquire about older vintages,” the menu advises. It felt like a birthday party when the candy bowl arrived. But it only came once and then. Silence. You can drink in this golden vision with your eyes at no charge by stopping by the d’Yquem storage window stage left as you exit. “We want this to be the greatest seafood restaurant in the world,” Zalaznick has said. Maybe it will be. Maybe not. For now, I find it fun and often delicious, even though I had to ask for a serving spoon twice. Could I become bored by the same old uni canape if I come back too often? The sardine toast with bone marrow and maple is good too. 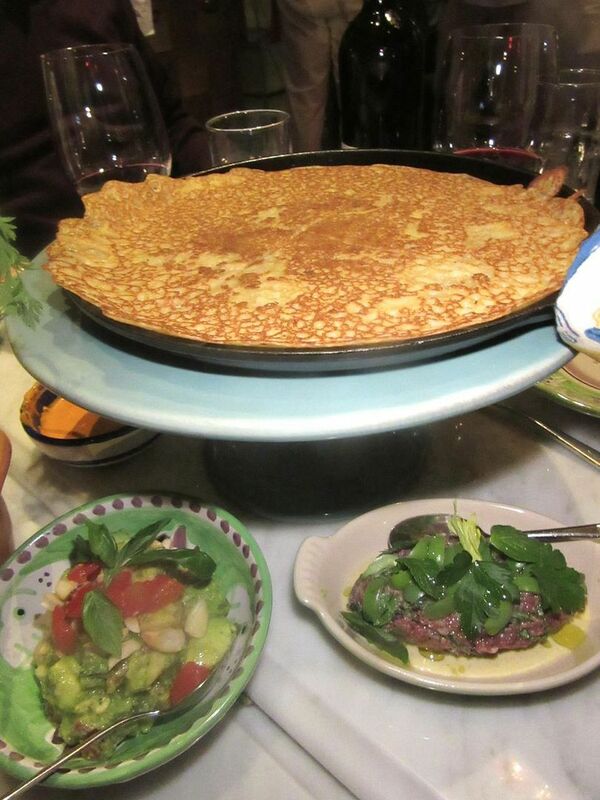 On Tuesday evening there was a newborn baby at the table behind ours. At one point the mother and a friend, maybe the nanny, left quickly. I tried not to think about it. Perhaps the kid will be back for her Sweet Sixteen. 99 East 52nd Street between Park and Lexington Avenues. 212 375 9003. Hours 5 pm to 11 pm. Closed Sunday.